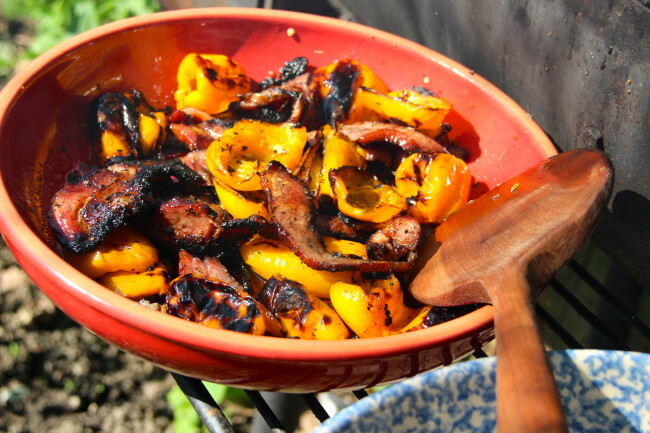 A beautiful savory killer dish that can be served at any summertime outdoor party (especially for the 4th of July!!) to much admiration. The reason? No typo here… Vive Le Bacon!! 2 lbs of Natural, thick-cut (maple flavoured if available) bacon, strips cut in two. 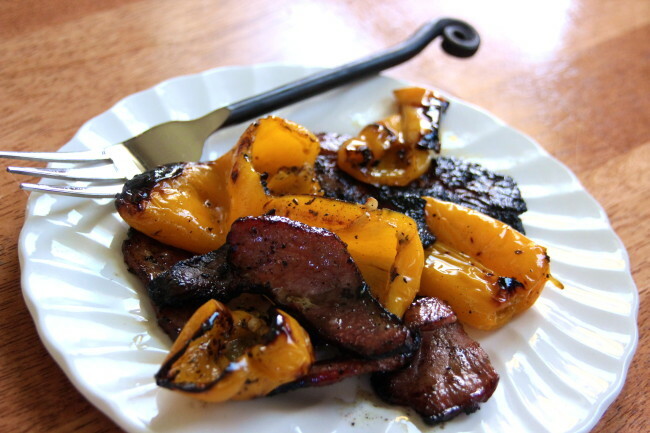 Lardon, or the French version of bacon is unsmoked and perfect for this recipe as it will be grilled and smoked, but this is very difficult to find in the states and so…. bacon it is! 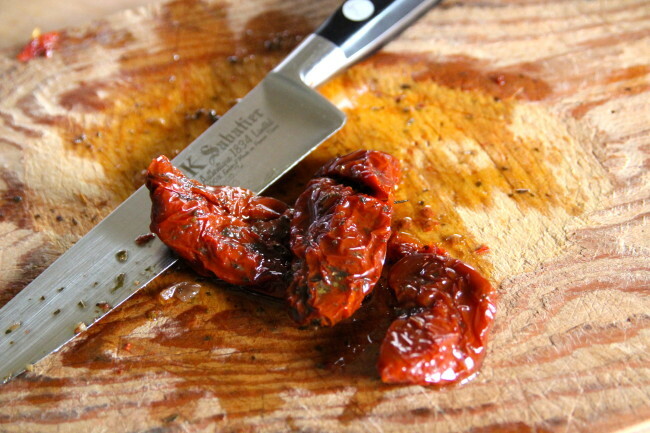 Toss sweet pepper strips in a large bowl with oil, a generous dash of salt and pepper and 2 tablespoons of Herbs De Province. 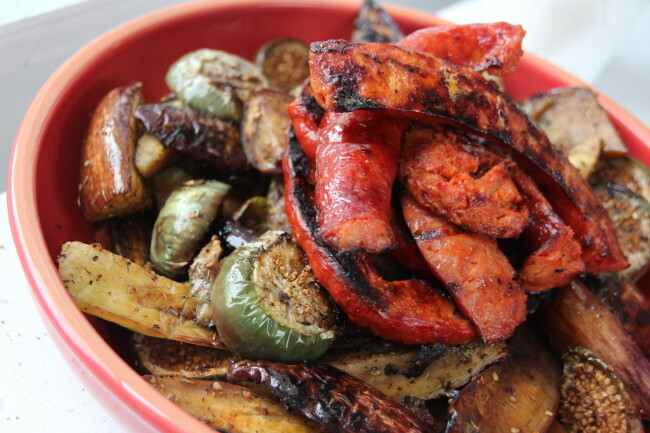 Place in 2 grill baskets over a hot charcoal fire, tossing occasionally with thongs. 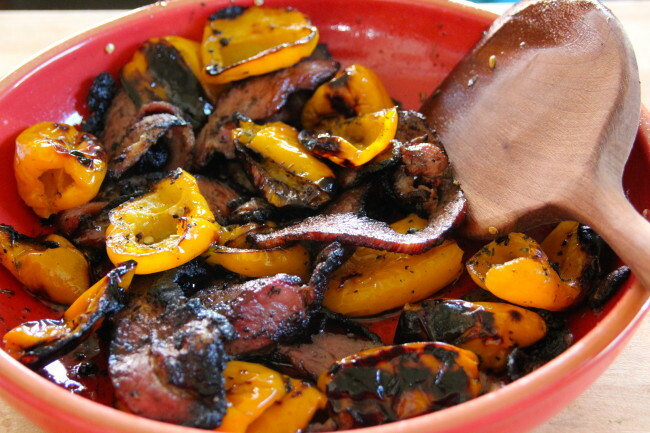 When charred nicely, remove from the fire and place back in a large bowl. Place bacon in same two stainless grill baskets and place over a hot charcoal fire. When the charcoal starts to flare from the melting fat, toss the bacon with tongs to cook evenly. When almost done, drizzle maple syrup over the bacon and continue to toss. Remove from fire when well coated and the syrup thickens on the bacon. 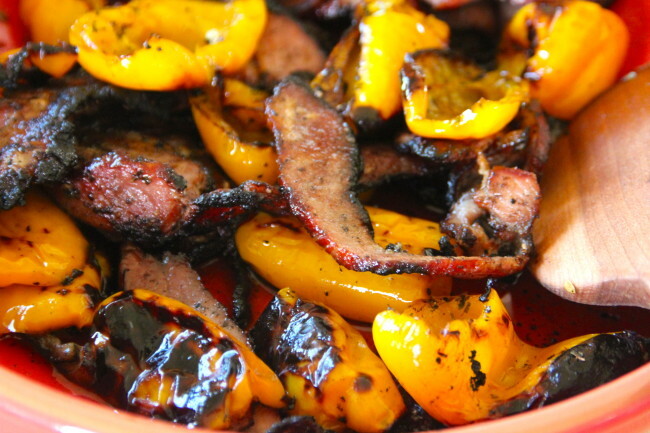 Combine the bacon with peppers, toss well and serve. 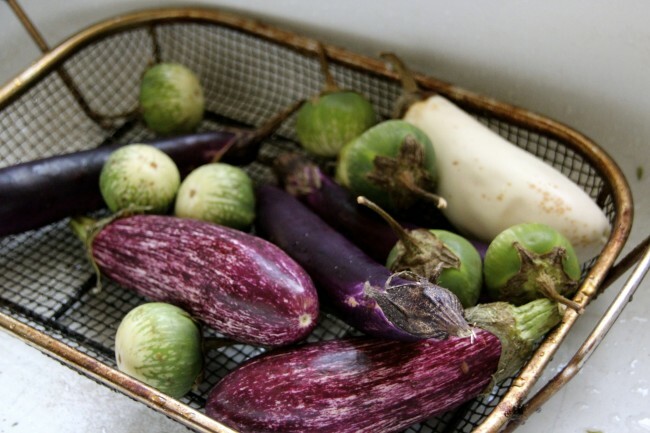 This is good as a side dish with a fresh summer salad and French bread. The beautiful tastes of summer are here! Nouvelle Cuisine is a great fusion of new and old French flavours, and here I showcase the both together. Make sauce by blending last 7 ingredients. 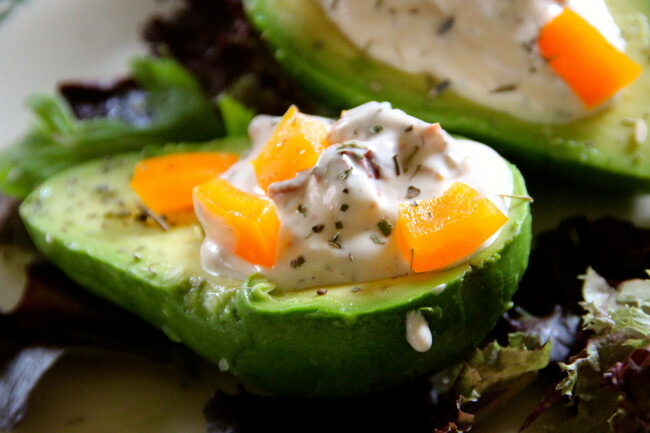 Slice avocado in two lengthwise, remove pit with knife by hitting pit with sharp end and twisting it out. Remove flesh in one piece by scooping it out with a large spoon. 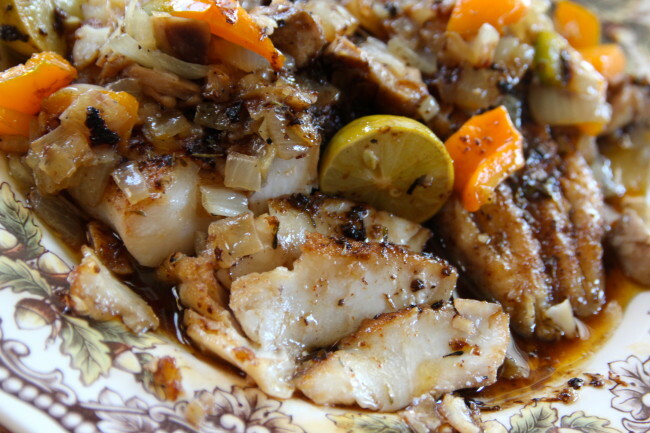 Place both halves on a plate and sprinkle with lime juice and fill pit cavity with sauce. 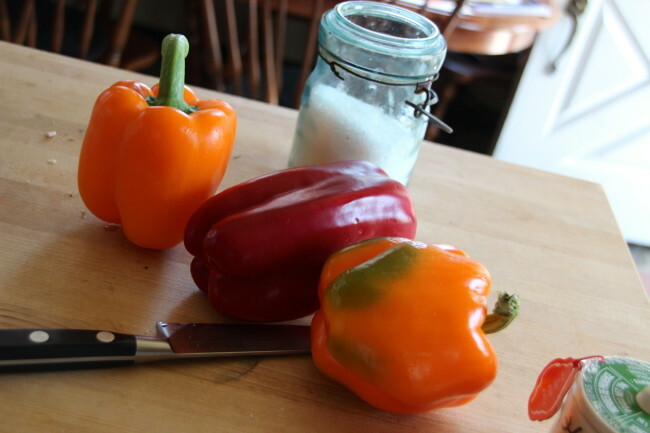 Garnish with diced sweet orange pepper and Herbs De Province. Serve with a nice crusty French bread. 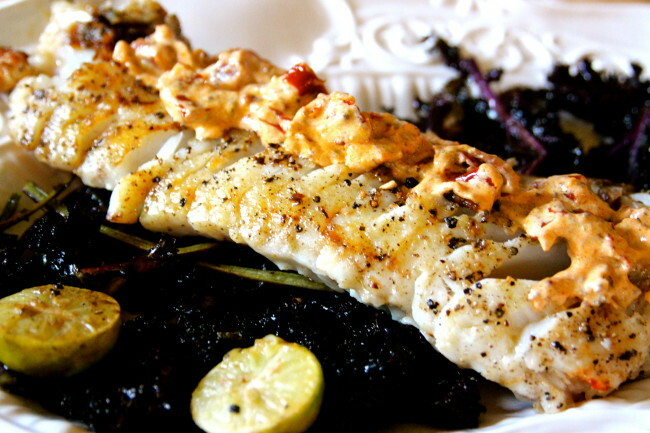 A very elegant, visually stunning and extremely delicious way to please your family and friends. In less than 30 minutes…really. 1 lb of scallops, chopped slightly into pieces. Place one tablespoon each of oil and butter and heat over a low to medium fire in a large skillet. Add chopped shallot and pepper. Cook, stirring occasionally until slightly browned. 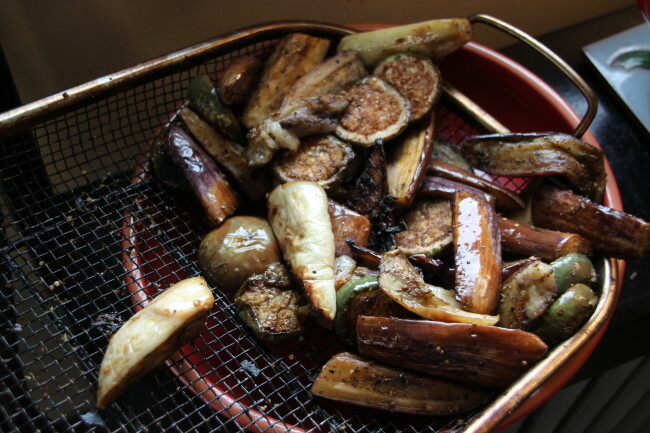 Remove from heat and place in a bowl in a warmed oven. 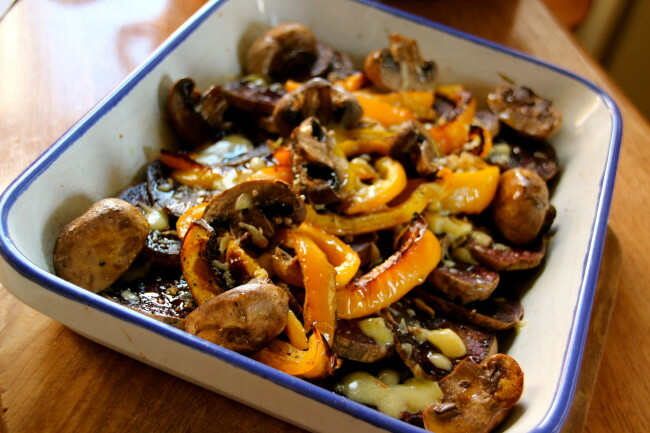 Add mushrooms to the same pan with one more tablespoon each of oil and butter, cooking over low to medium heat. Brown both sides, about 8 minutes total time. Remove and place on a warm platter. 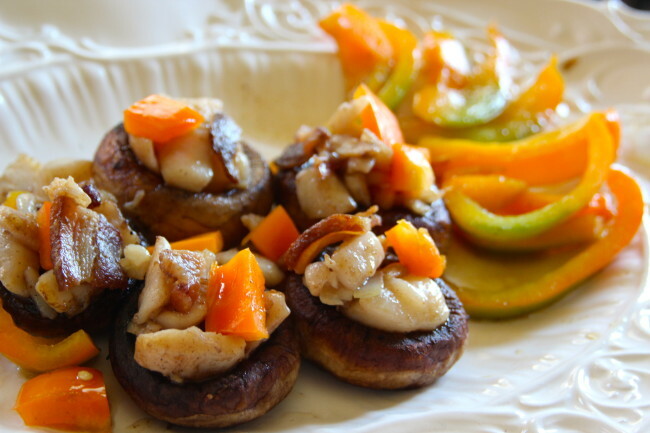 Place scallops in the same pan with the remaining juice from the mushrooms. Add a pinch of salt and pepper and cook over a high heat, stirring occasionally. 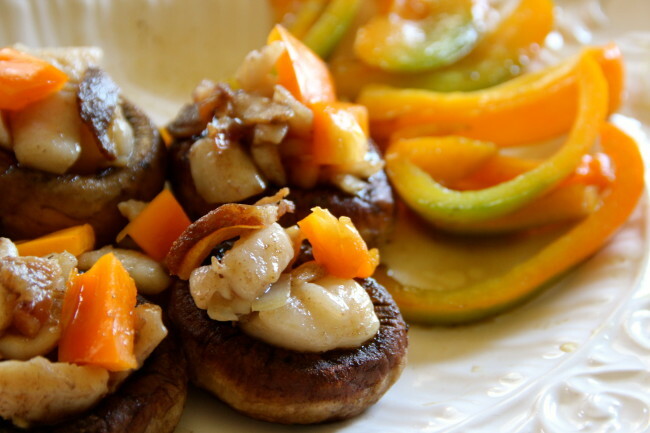 Remove from pan after 2 minutes and place in the center of the mushrooms. Top with the shallot and peppers and pan juices from the scallops. Top with diced bacon. 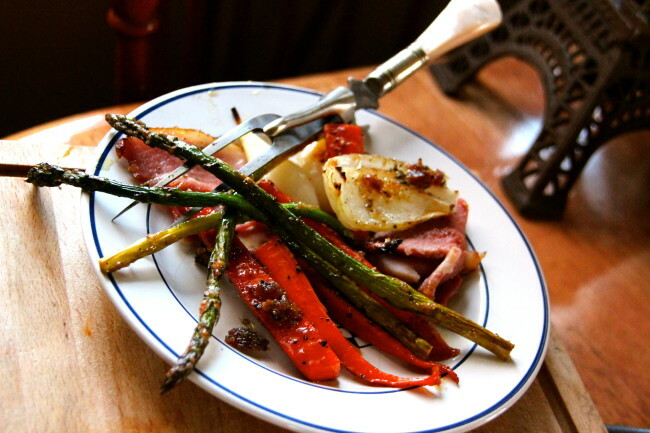 Garnish plate with pepper slivers. Voila!! Asparagus season is here!!! And so is the grilling season. 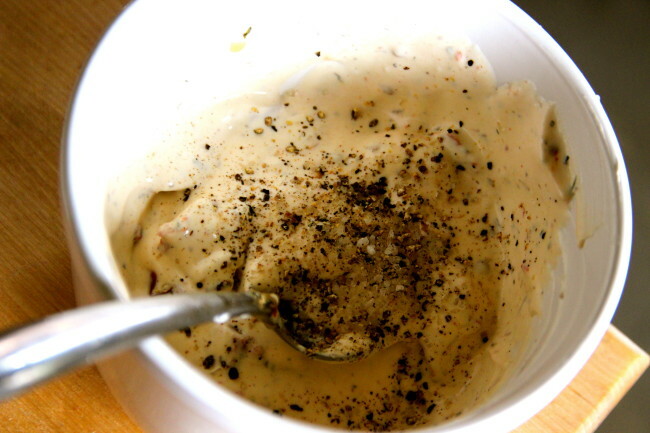 Put the two together and pair it with a fig cream sauce and this is going to blow you away. 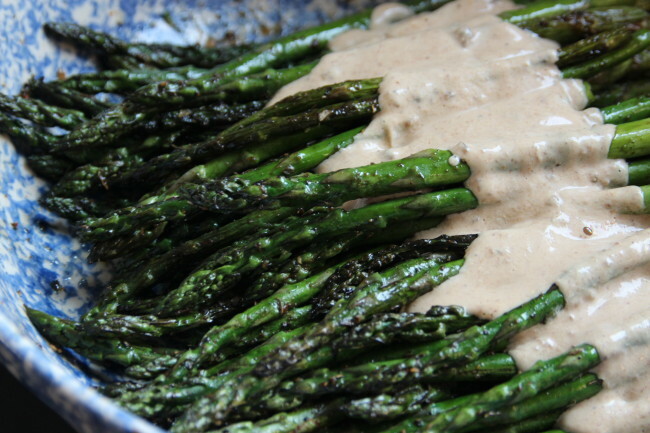 Asparagus was a vegetable used much and often in the French restaurants of my family, and I eat it often with fond memories still. 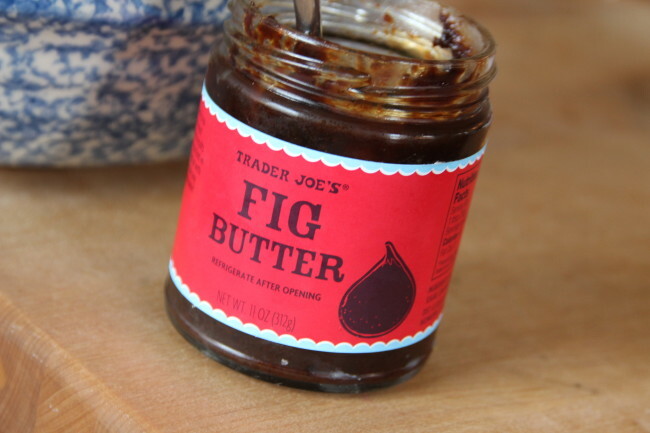 Figs are quite popular in French cuisine and in today’s fast-paced lifestyle I will use a nice fig butter made by several companies (I use Trader Joe’s) instead of trying to find fresh figs and making my own. Kind of like having a prep chef at your disposal! 2 lbs of fresh asparagus, last 1/2 inch of end trimmed. Mix all of the ingredients for the sauce well in a small saucier pot and place over the lowest flame setting on the back right (sauce) burner, stirring occasionally. 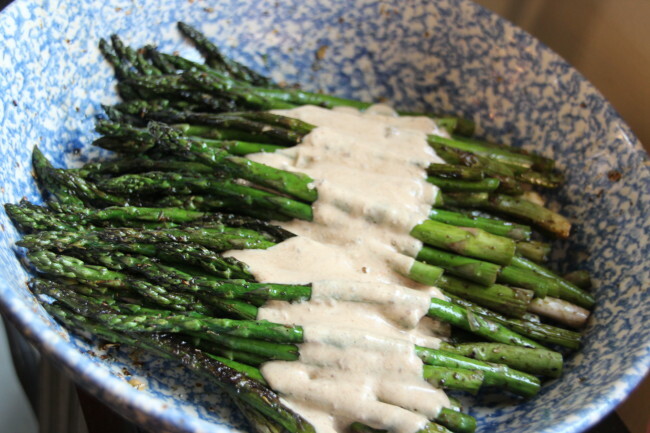 Mix the asparagus in a large bowl with the oil, salt, pepper and herbs. 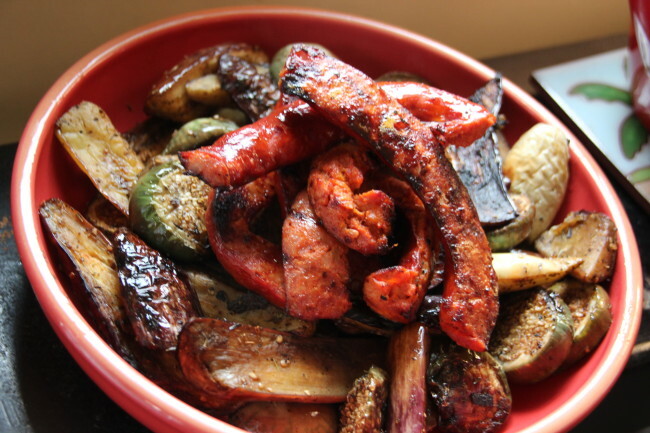 Grill over a hot charcoal fire in a stainless steel wire grill pan, stirring occasionally until slightly crunchy and slightly charred. 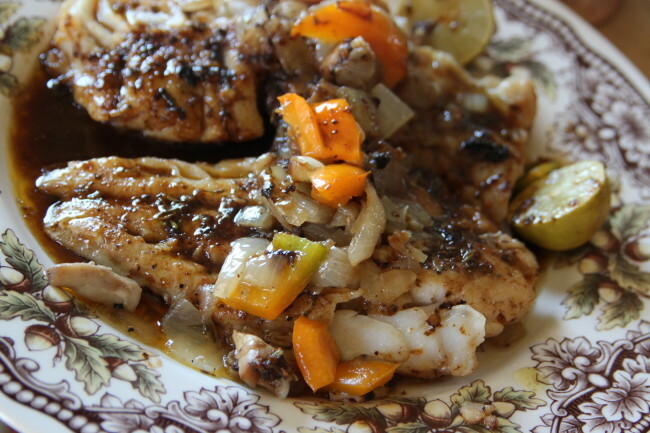 Serve with sauce as a side dish or a main lunch dish with a nice white wine! 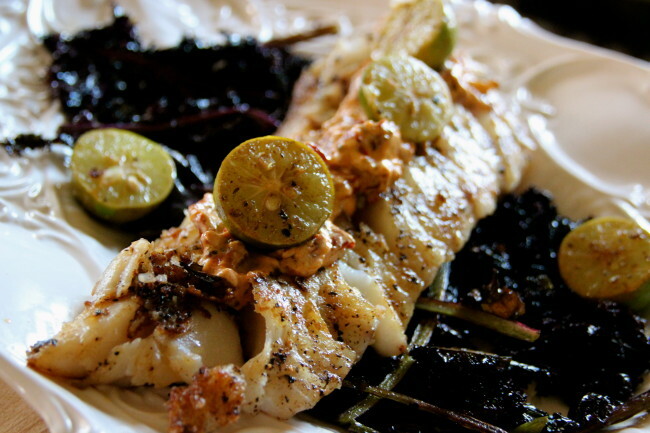 Great fresh seafood is at my doorstep here in New England and I certainly enjoy it as much as I can. Living in the number one fishing port in the US certainly has it’s advantages! I love to take a fresh piece of fish, this time Pollock and pan sear it accompanied with a cream sun dried tomato sauce and sautéd purple kale. Wow!! 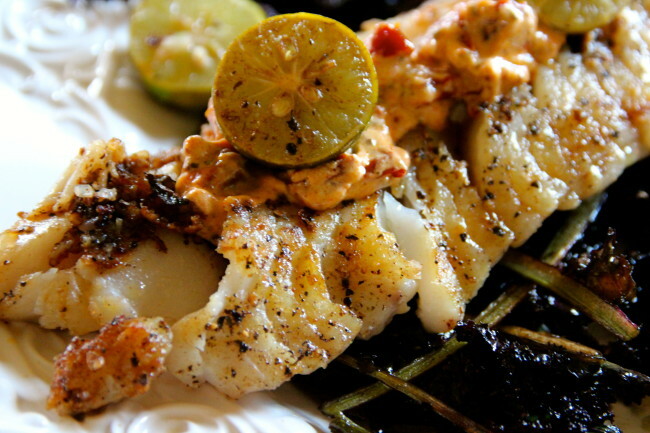 This is great way to enhance the delicate flavours of this fish…. 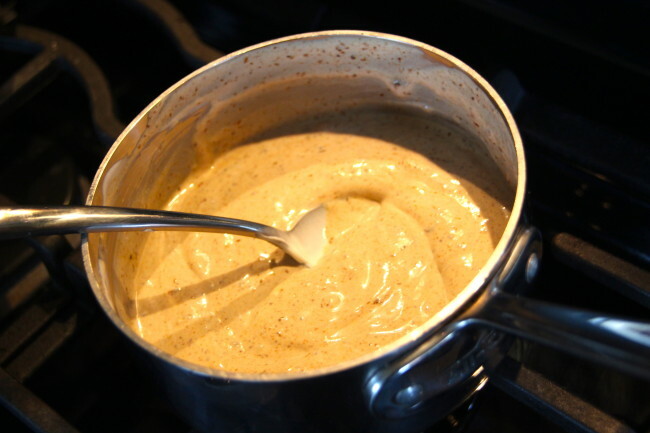 For the sauce, add all of the sauce ingredients into a small saucier pan and heat on low, stirring occasionally. In a large sauce pan, heat 2 tablespoons of butter and two of olive oil on a low to medium heat. Add the kale and sprinkle with salt and pepper. Sauté until tender, stirring occasionally, about 10 minutes. Remove from pan and keep warm in a covered bowl. In the same kale pan, add two more tablespoons of butter, two of oil over a low to medium fire. 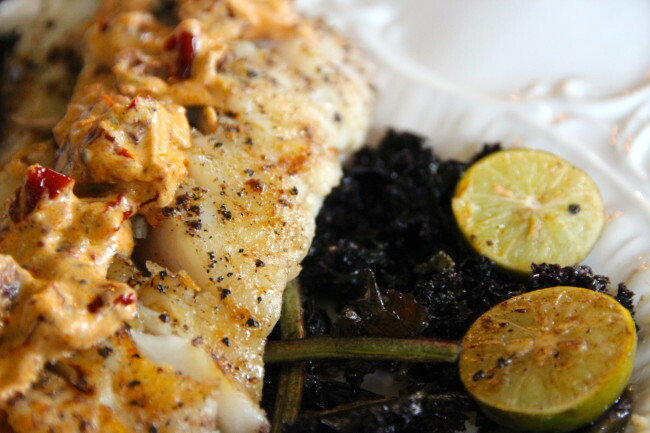 Season the fish on both sides with salt and pepper. If using a thicker cut fish like I did (pollack or cod) heat on one side for 5 minutes and gently turn. 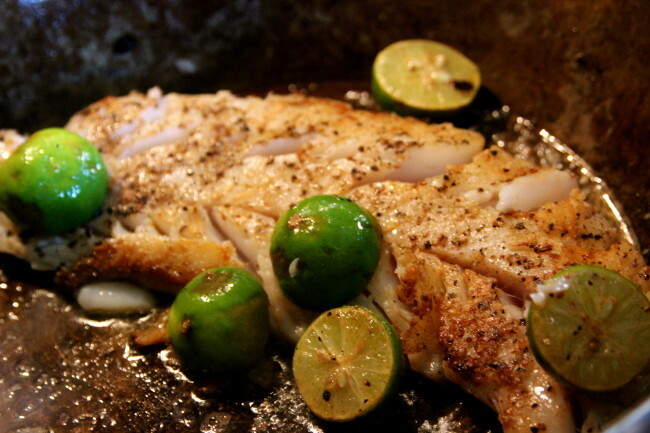 Add the limes to the pan. Cook for another 4 minutes, or until it flakes easily. 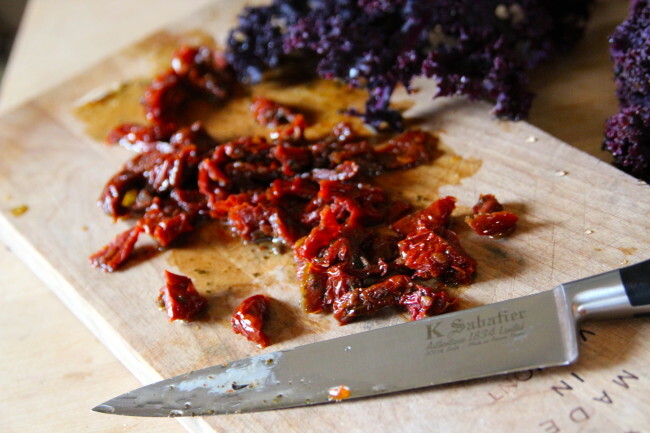 Place the fish on the kale and top with the cream sun dried tomato sauce. Voila! Pre-heat the oven to 425 degrees (F). 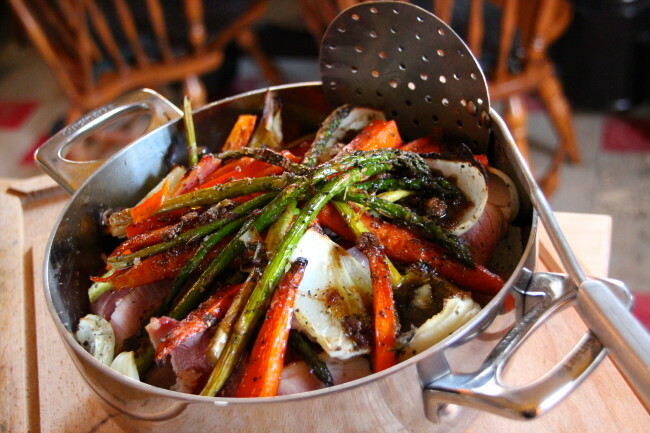 Toss all three vegetables in a light coating of the olive oil, a sprinkling of salt, pepper and herbs de Province. 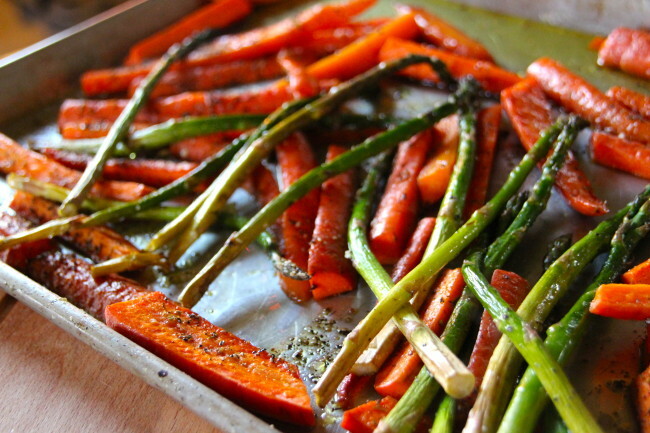 Roast the vegetables in large baking trays until lightly charred, about 45 minutes. 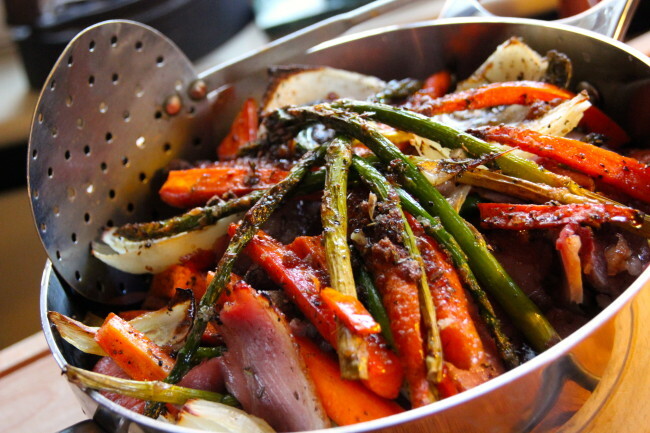 Layer the vegetables with the ham in a 6 quart gratin dish or 6 quart dutch oven with the liquid from the roasting pans, sprinkling the brown sugar between layers and on top. Place the dish bake in the oven and cook for another 15-20 minutes. Remove from the oven and toss gently to blend the juices. 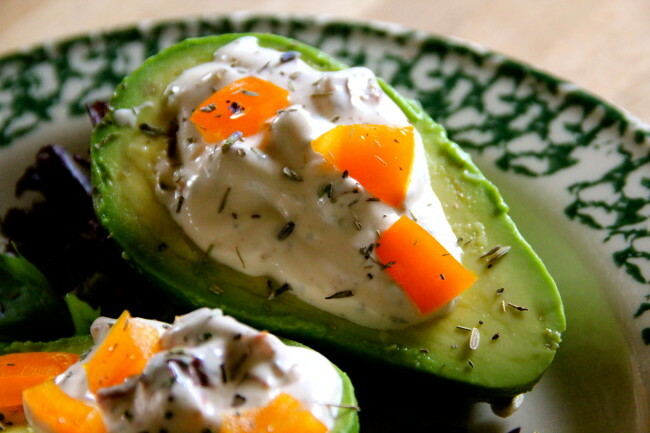 Serve with a crusty French bread! 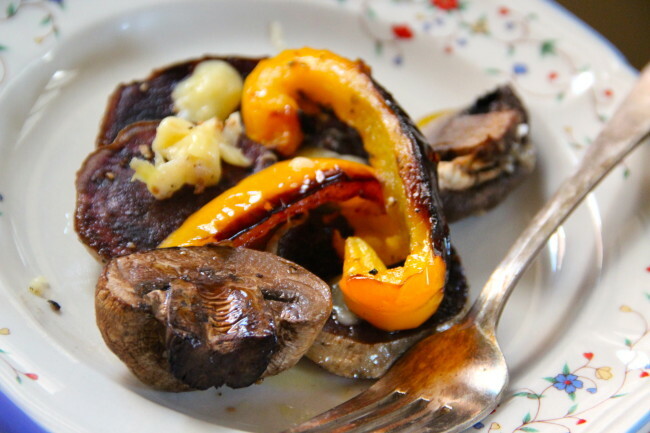 Roasted sweet potato and roasted sweet yellow peppers come together for a burst of satisfying, earthy, mouth watering flavours. 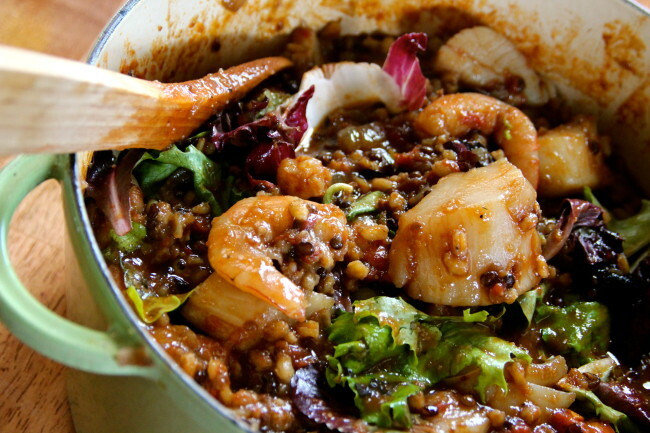 This is an amazing dish that is filled with great savory/sweet notes. 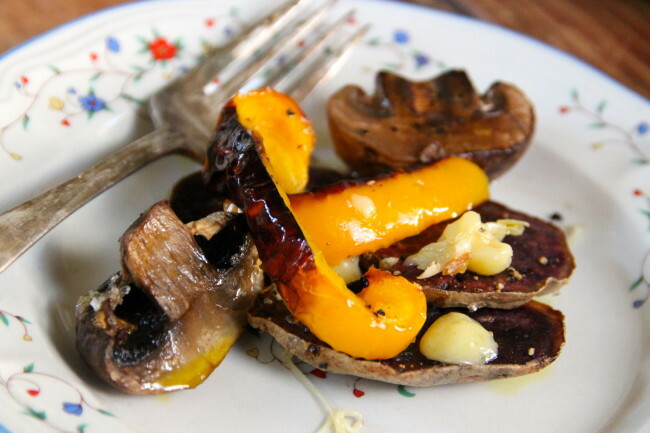 A great dish to help welcome spring! 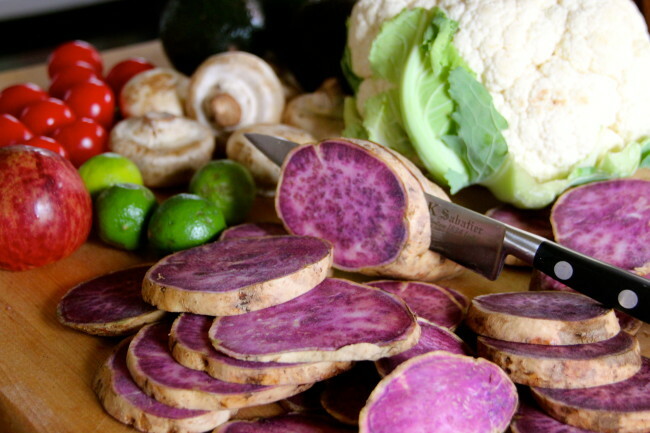 Slice sweet potatoes into 1/4 slices, and coat with 1/4 cup of extra-virgin olive oil in a large bowl adding a generous pinch of sea salt and fresh cracked pepper, gently tossing to coat evenly. Roast in the oven on large baking pans/sheets sprayed with a non-stick vegetable oil spray for about 25 minutes, turning potato slices half-way through cooking time. Remove from oven and place potatoes aside in a bowl. 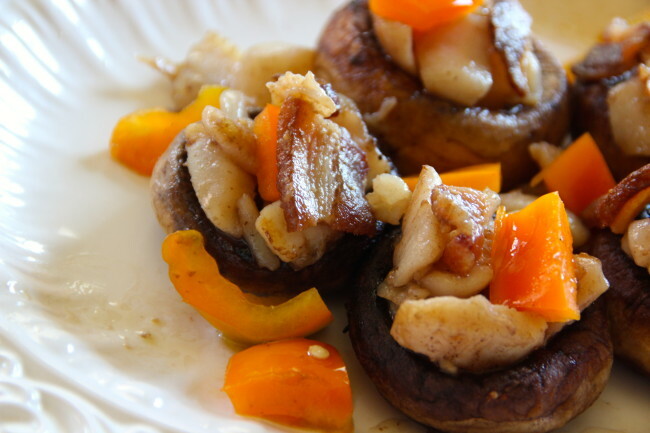 Slice mushrooms in 1/2 and slice sweet pepper in to 1/2 inch strips. 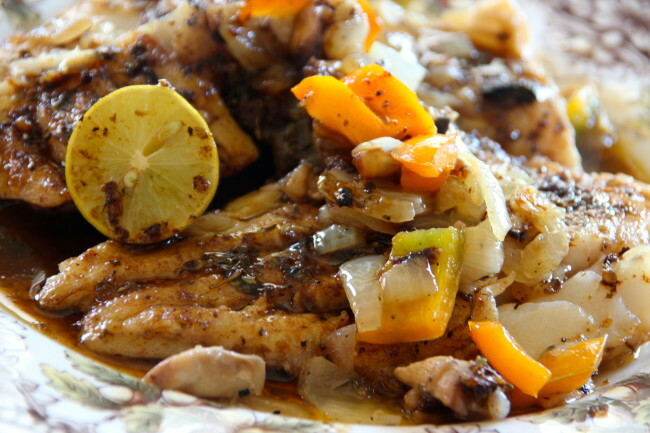 Coat with 1/4 cup of extra-virgin olive oil, a generous sprinkling of salt and pepper and coat evenly. Roast on the same large trays (spray trays with more vegetable spray) for approximately 25 minutes, turning 1/2 way through baking time. 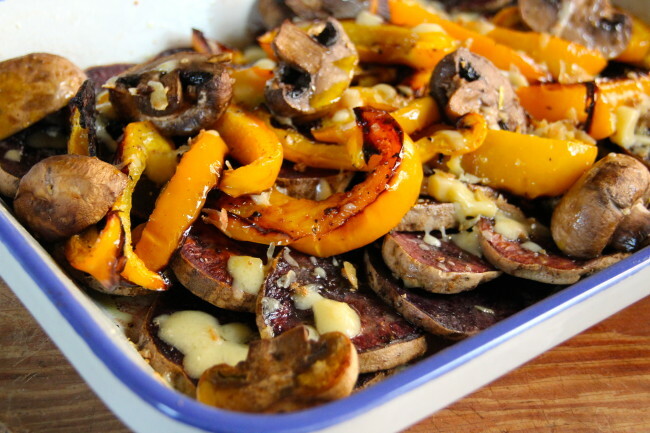 Layer vegetables, potatoes first, then sweet pepper and mushrooms. Pour sherry over and sprinkle with 1 cup of shredded Emmentaler cheese if desired. Bake in the oven, same temperature for 25 minutes. 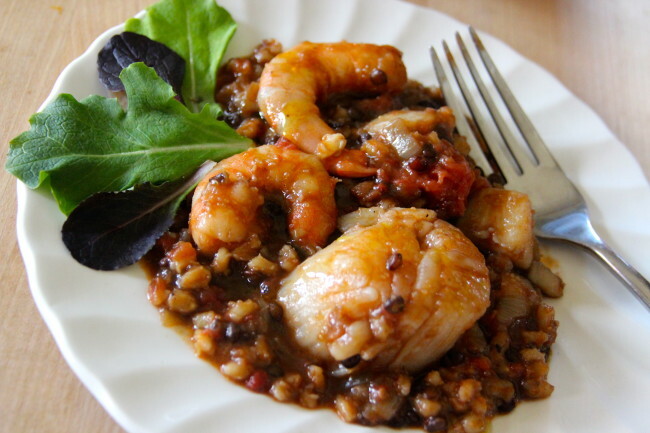 Tender large sea scallops and shrimp are gently cooked with whole grains like barley, black lentil and amaranth in an organic tomato base that will have your mouth explode in flavours, not to mention the incredible health benefits from all of the carefully selected ingredients for one of my signature seafood dishes. And guess what? 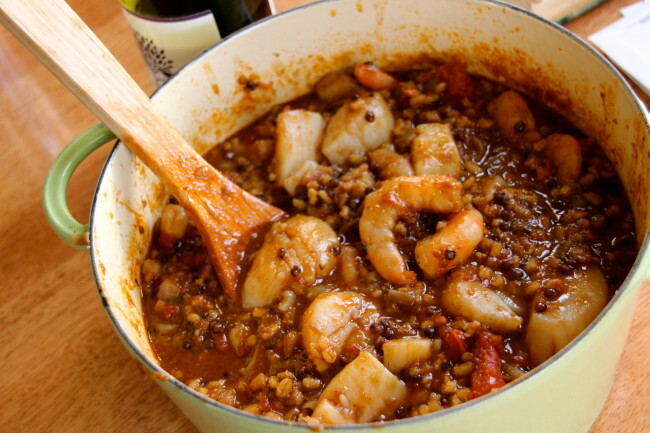 It’s a one pot, very easy seafood comfort dish you can let cook as you enjoy your wine with you family and friends. 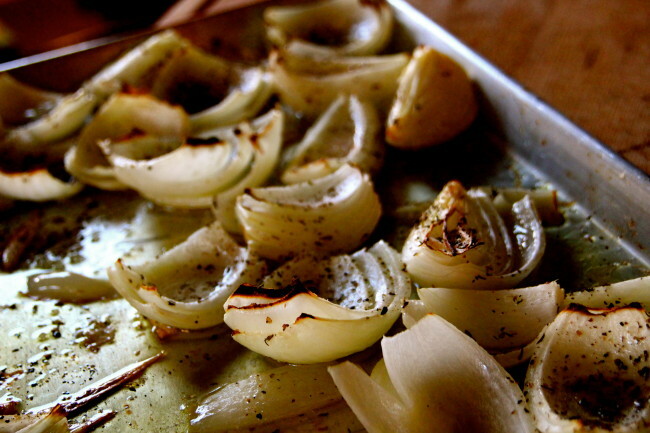 In a 6 quart dutch oven, saute the onion in the butter and oil until golden in colour. 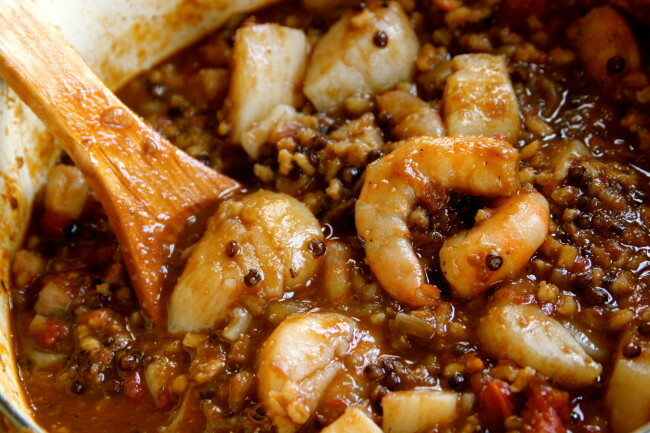 Stir in all of the rest of the ingredients with the exception of the seafood, covering, cooking for about and hour on a low heat, until the grains are tender. Stir every 15 minutes and check to make sure water does not have to be added toward the end if it s too thick. 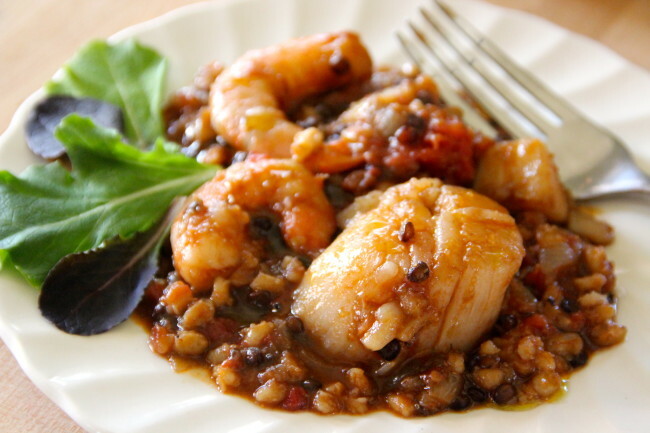 Stir in the seafood when grains are tender, cover and simmer on a LOW flame for about 10 minutes – until the scallops are barely cooked and very tender. When done, I mixed in 2 cups of baby greens for added color and health benefits. This step is not necessary, but I think it adds nicely to the dish.